CINCINNATI, OH (June 1, 2017) – Hollaender Manufacturing, manufacturer of Interna-Rail® aluminum railing systems, recently designed a customized Interna-Rail KLEAR railing system for Cincinnati-based, Rhinegeist Brewery’s rooftop patio. The installation minimizes obstructions, while allowing visitors to safely enjoy views of the historic Cincinnati skyline. 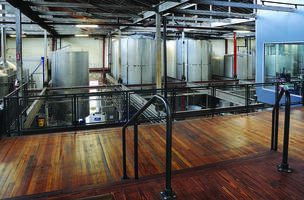 Rhinegeist Brewery, now occupying space that was previously a Christian Moerlein beer bottling plant, began brewing craft beer in 2013. 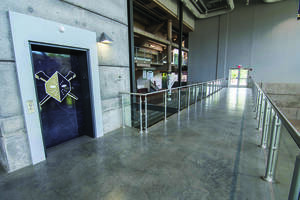 Situated in the historic Brewery District in the Over-the-Rhine neighborhood of Cincinnati, Rhinegeist wanted to make use of excellent views of the Cincinnati skyline from the rooftop of its new space. 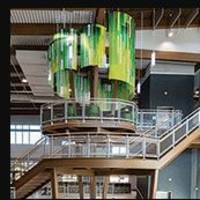 Wichman-Gunther Architects turned to Hollaender Manufacturing, also a Cincinnati based company, to design a handrail system that would accentuate the view while minimizing obstructions created by the railing itself. 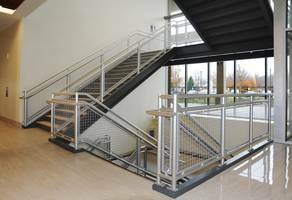 Hollaender recommended its Interna-Rail KLEAR aluminum handrail system with 42” tall glass infill panels. 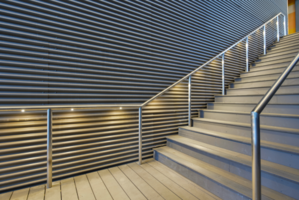 Interna-Rail aluminum handrail systems are sleek, strong and durable. In-line fittings make it easy to install, and produce a striking architectural appearance. 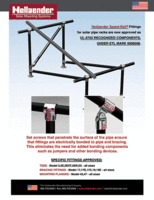 The offset panel attachment provides an uninterrupted infill panel railing system. The Interna-Rail KLEAR railing is designed specifically for glass infill panels and does not have a top cap on the glass. The glass is captured at the post, not top and bottom, thus minimizing the amount of horizontal rails in the systems while maximizing visibility. Hollaender Interna-Rail with steel mesh infill panels, all coated in black, was also selected for use inside the brewery around the brewery tanks.